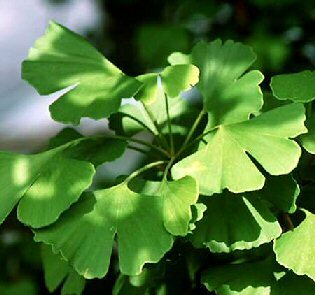 Maidenhair Tree. The sole representative of one of the most ancient genera, the Gingko may be considered a true living fossil as its ancestors flourished in many parts of the world during the Jurassic Period, from the evidence of fossils dating back 200 million years ago. 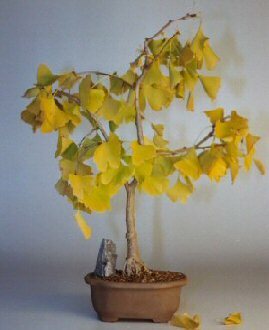 The Ginko Biloba is the hottest trend in both health foods and bonsai. It's regarded in eastern cultures as the "Fountain of Youth" plant. The herbs from the mystical plant are thought to improve health and memory. Easily distinguishable by the characteristic two-lobed, fan-shaped deciduous leaves which turn deep yellow in autumn. Fruits arranged in clusters are golden yellow when ripe. Keep outdoors. Available 12 months a year. May have no foliage during autumn and winter months.